There is another variation of MG-36115, which has the same jacket artwork as Mercury MG-20551 (mono) and SR-60119 (stereo). 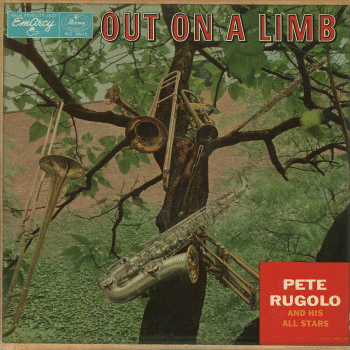 A companion album of MG-36082: Pete Rugolo's energic and experimental big-band sound, backed up with many famous ex-Kenton pals. 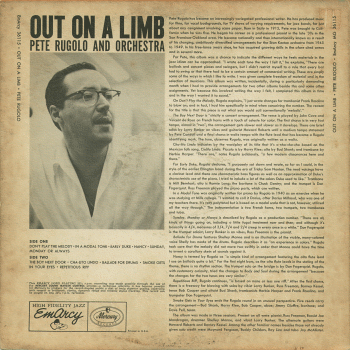 Pete Rugolo, former Kenton-band chief arranger, here tries to arrange and conduct very experimental big-band sound, as we can also hear in his Columbia years. Assorted musicans include vary famous and talented west-coast guys including Maynard Ferguson, Frank Rosolino, Russ Freeman, Shelly Manne and many many more. A great sound. The rest of the recordings from the same session was appeared on MG-36082 “Music For Hi-Fi Bugs”. And Stereo version can be heard on SR-60118 “Music From Out Of Space” and SR-60119 “Rhythm Meets Rugolo”. Recorded in Los Angeles, CA on July 9, 1956. Larry Bunker (vib, xyl, perc, tympani). 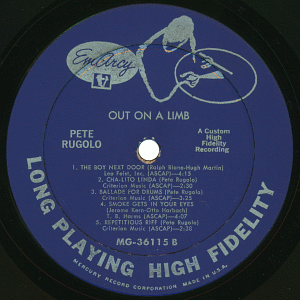 Recorded in Los Angeles, CA on July 10, 1956.
same personnel as A-1, except Don Fagerquist (tp) replaces Don Paladino. 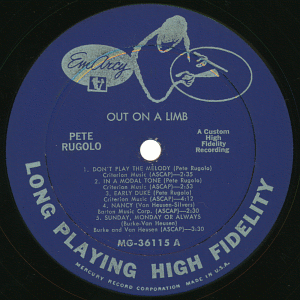 Recorded in Los Angeles, CA on July 11, 1956. Barney Kessel (g) replaces Howard Roberts. Recorded in Los Angeles, CA on October 29, 1956.
visitors to this page since March 3, 2004.